Little ones escape to a tropical paradise with a ukulele they built and decorated. 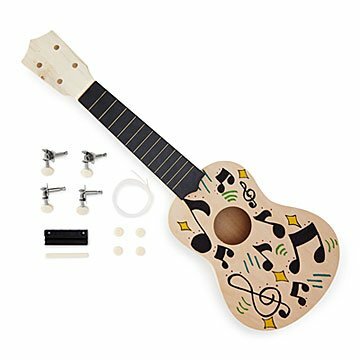 What do ukuleles and your little one have in common? They might be small, but they both bring big, happy vibes. This build-your-own kit is a great gift for creative, music-loving kids. They'll put together the poplar and basswood pieces, then decorate the outside however they want—maybe it's beach scene, or their favorite doodles (acrylic paint works best). Once the masterpiece is dry, they're ready to strum those sweet island melodies, sending listeners to a Haiwaiian island, at least in their mind. Made in China.